Let me be the first person to say that no child NEEDS a Valentine’s Day gift. Some pink milk and a handful of Hershey’s Kisses and you can call it a day. But, as a parent, it’s sometimes really FUN to give Valentine’s Day gifts for kids. And if you’re looking for gift ideas that will actually get used instead of just being another thing to clutter up your house, I hope you’ll find these suggestions helpful! Colored Bath Tablets. This was on my $5 gift guide this year, and I bought a pack for Tally for Christmas. All four of my girls are OBSESSED with them and love choosing color combinations and watching them change the water. They haven’t made any marks on my tub, my floor or my towels, which I don’t understand, but I’m not complaining. Seriously the most fun $4 you can spend. Rain Boots. I mean, what’s the point of having a blog if you can’t occasionally plug your own products? 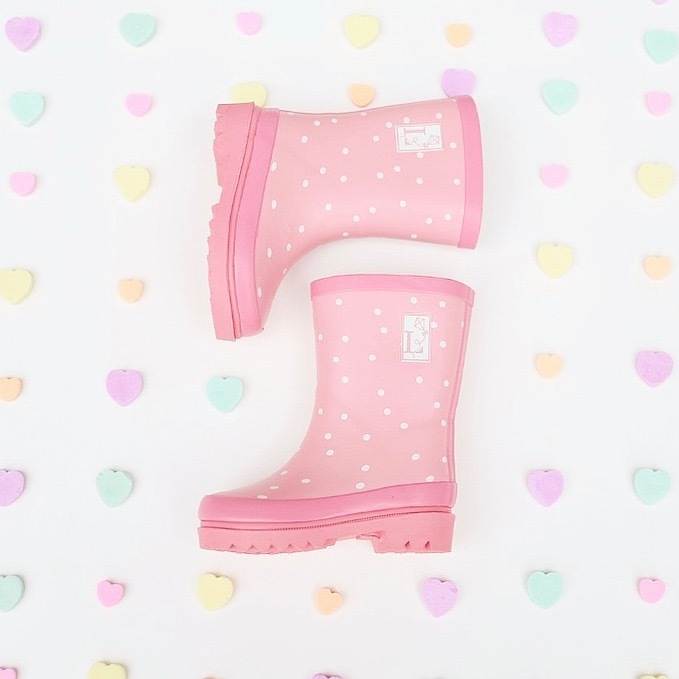 It’s rain boot season and I love a gift that’s both fun for kids and totally useful and practical. And a shoe that your child can put on themselves? Lifesaver. I love all eight patterns like my own children, but I have a special soft spot for the florals (perfect for spring and Easter!) and the black windowpane. And they’re 14% off for Valentine’s Day with the code LONDONLITTLESLOVE. Spy Pens. This was another pick from the $5 gift guide and my girls have played with them non-stop. They’ve actually been great for Ani who is learning to read because she practices writing ALL the time with them. Just get a pack of 12 for $13 and then just split them amongst your children. Kiwi Crate. This was the number one request from my girls for Christmas and they wait all month for their boxes to arrive. They love working on the projects and you can get your first month free (you just pay shipping of $4.95) here. Also, people ask what I do with the projects when they’re done with them – I don’t feel any compulsion to keep every project my children do and I let them play with them for a week or so before we recycle them and keep any extra supplies in a single box for future open-ended projects. Bookroo. Obviously, you can’t go wrong with books as a gift, and I love the fun of getting several wrapped books in the mail each month. We’ve had a subscription for over a year for each of my girls (board books, picture books, and chapter books) and they never get old. A New Game. You know we love games at our house and I listed a whole bunch of our favorites here. If I had to choose one, it’d be Sleeping Queens which has been a favorite for years with my girls once they turned about 3 or 4. For slightly older kids, we also LOVE Dutch Blitz (Ani could play it when she was about 5.5). Play Doh. This is what I’m giving my girls for Valentine’s Day this year – they’ve been playing with the glitter Play Doh I gave them in their stockings non-stop along with this set of cookie cutters and rollers that my mom gave us a couple of years ago. It seriously keeps all four of them entertained for HOURS and it’s the first thing Tally asks for when she gets up in the morning. Do you do Valentine’s Day gifts for your children? I’d love to hear what you’re giving! Previous Post: « Have you heard of Audible Originals? I’m getting my kids spinning tooth brushes. $5 at WalMart and cleaner teeth! I love your ideas! Play doh is my go to activity when I really need to get something done!